Comes in trays that can be detached one by one, allowing you to cook just the quantity you need. 105g total (three 35g servings). 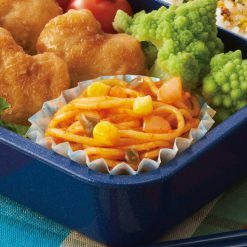 These mini-sized spaghetti Neapolitans are handy as a garnish, or as an addition to a bento box. 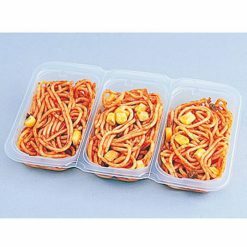 They come in trays that can be detached one by one, allowing you to microwave just the quantity you need. There are several stories about how spaghetti Neapolitan came to be. One of these is that it was first made just after World War II, when a Japanese chef decided to create a dish based in part on foods and ingredients used in American army rations. To cook in the microwave, remove the spaghetti Neapolitan (still frozen) from its bag and microwave uncovered approximately as follows. In a 500W microwave, cook one serving for 1 minute 20 seconds, and three servings for 3 minutes. In a 600W microwave, cook one serving for 1 minute, and three servings for 2 minutes 30 seconds. Cooking times will vary depending on the model of microwave and the number of servings being microwaved at one time. Keep an eye on the spaghetti Neapolitan as it microwaves to avoid overcooking or undercooking. This product contains spaghetti (durum wheat flour), vegetables (onions (domestic), bell peppers, corn), tomato ketchup, vegetable fats and oils (rapeseed oil, corn oil, sesame oil), grated garlic, flavoring extract (enzymatically hydrolyzed wheat gluten, yeast extract, vegetable extract), table salt, sugar, dextrin, spices, vinegar powder, (contains soybeans)..